If I had to choose a type of ethnic food I love the most, I would select Greek or Mediterranean cuisine. Something about the eggplant and potatoes and lemony flavors, olive oil and clean spices grabs me, yet I seldom prepare these dishes at home…don’t ask me why because I really have no idea. 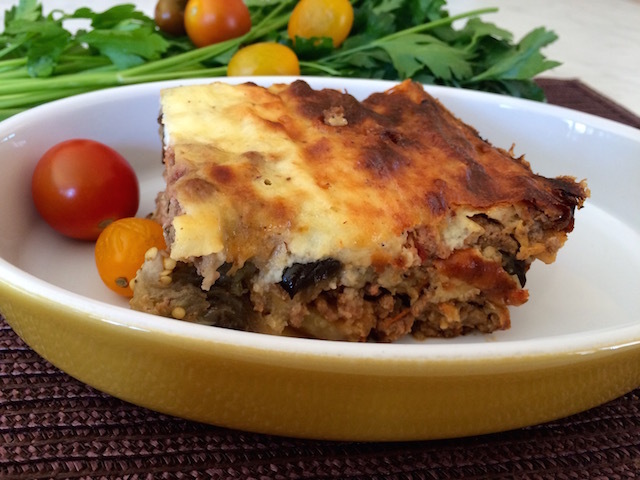 I recently started fantasizing about Moussaka, one of the best known of all Greek main dishes. Layers of sauteed vegetables (in my case, eggplant and potato), covered by layers of meat sauce topped with a savory custard Bechamel. I visited Greece in 1973, and during that trip I ate Moussaka nearly every single day. 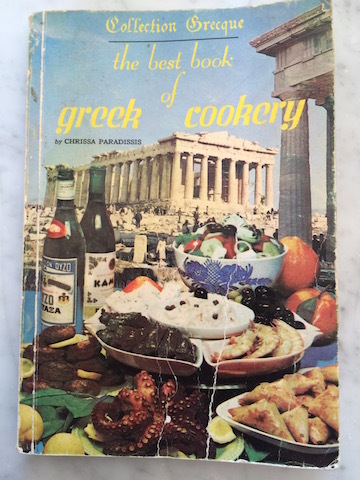 I also bought a small paperback cookbook at a streetside kiosk (published in 1973) that has very very basic simple authentic Greek recipes. And I have used that book so many times I can’t count. My beloved cookbook – covered in olive oil and fingerprints … still one of my most treasured books. BUT the last time I can recall making Moussaka was probably back in the late 1970s. We were living in Iowa, I had one child and we made friends with another couple, Mary and Steve. My husband and I cooked with them a lot and produced some pretty awesome weekend meals. I distinctly remember sitting in their kitchen and consuming lots of Moussaka and huge bowls of Greek salad. Those were the glory days! And then I forgot about it. Moussaka, as good as it is and as much as I love it, requires many steps. Salting the eggplant, waiting, rinsing, roasting the eggplant. Roasting the potatoes, chopping fresh vegetables for the sauce. Grating the cheese, preparing the fresh bread crumbs, finishing with cooking the Bechamel. Dishes… More dishes. Too many dishes. 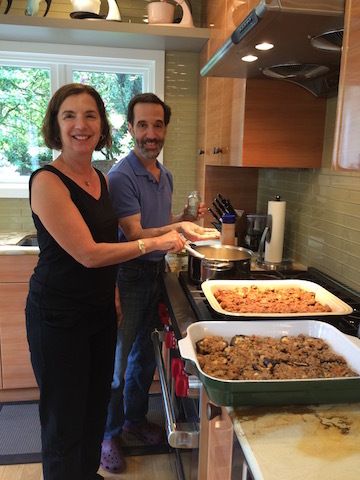 When my brother Kal was here a few weeks ago baking Rhubarb Crostata and salted chocolate cookies with me, we made a date to create Moussaka. I sent him my recipe and we individually made everything but the Bechamel sauce. He used chicken sausage with mushrooms (his wife doesn’t like red meat) and I used lamb. The following day we did the final Bechamel at his house and baked our Moussakas and had a taste test. I do confess that we both agreed this wasn’t a good project to do together since all we really did in tandem was the final Bechamel, but otherwise we’d have been cooking for four hours in one of our houses. However, we caught up and had fun conversation while the Moussaka baked away. And what, pray tell, does someone like me – with a healthy appetite, mind you – do with a lasagna pan full of rich Moussaka? I gave away a couple squares to friends who also love this dish then cut the rest into serving sizes, each piece enough for two large servings and froze it for later. At least four meals for two people, essentially. I’m guessing this won’t last too long in the freezer… it’s just the perfect dinner to reheat when it’s a rainy or cool evening. 3 medium sized tomatoes, core removed and diced into ½ inch pieces. Weighing the two eggplants and two potatoes together you should have about three pounds worth. Make in a large 9 x 13 inch or bigger lasagne pan that has been coated with olive oil. Remove about 3 vertical strips of flesh from the eggplants with a peeler and slice the flesh horizontally into ½” rounds. Stack in a colander after coating the pieces with about two teaspoons of salt. Weigh down the eggplant with a plate to put pressure on the slices, and leave one hour. Meanwhile preheat the oven to 400 degrees with the oven rack in the middle. Remove the eggplant from the colander and dry each slice with paper towels, squeezing gently. Place each slice on a parchment lined cookie sheet at 400 degrees for and bake for 20 minutes per side. (I was able to fit two eggplants worth on one large cookie sheet.) When you turn it over halfway, loosely cover the sheet with foil to help make it tender. It softens just fine even without oil. Peel and slice the potatoes widthwise, about ⅜ inches each. Dry the potatoes with paper towels and lightly brush the pieces with olive oil on one side. Bake oiled side up for about a half hour at 400 degrees until the underside is a little golden brown. You don’t need to flip these over. Set aside the meat sauce until it cools and thickens. The meat sauce isn’t “saucy” but rather thick and resembles a bolognese. First make a layer of potato, then top with half of the meat sauce. Spread everything out evenly, trying to cover the potatoes. Then lay out the eggplant slices atop the meat sauce and top them with the remaining meat sauce, again spreading the meat evenly. At this point either pour over the Bechamel sauce or cover and refrigerate the moussaka until the next day. Melt butter over low heat, add flour, salt, pepper and nutmeg and stir for two minutes. Remove from heat and gradually add warm milk until thick and smooth. Put back on the stove on low heat. Pour Bechamel sauce over the top of the final meat sauce, evening it out with a knife so it covers everything. Bake at 350 for 45 minutes or until golden brown. Let rest at least 20 minutes before cutting. The next day it holds together more easily and tastes even better. For leftovers – cut into serving sizes and freeze in airtight containers. PS: You can make this with all eggplant, or with zucchini, eggplant and potato. Cook’s choice. 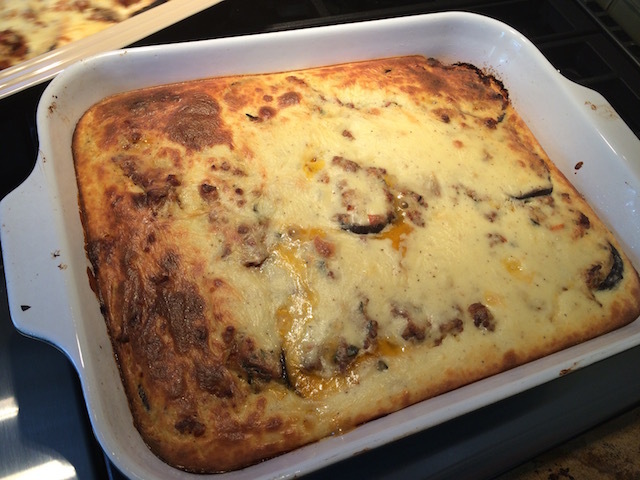 This entry was posted in Meat and tagged Moussaka. Bookmark the permalink.